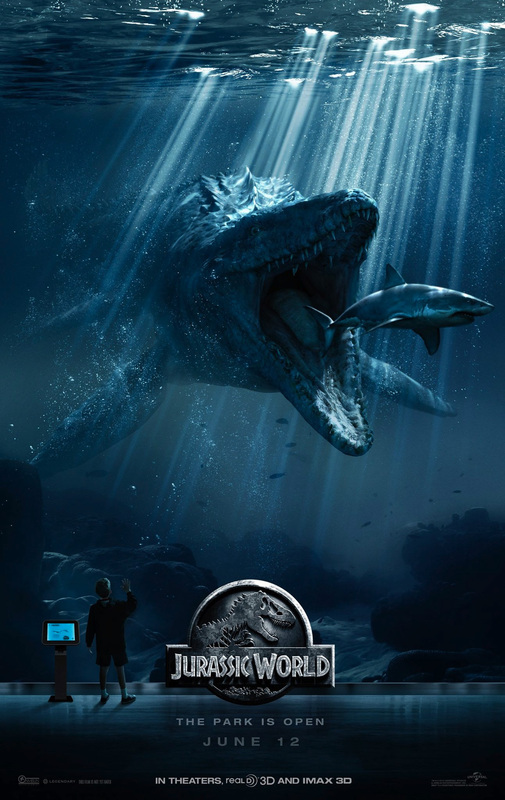 Jurassic World is a science-fiction adventure film that takes place roughly 20 years after the events of the classic Steven Spielberg directed original Jurassic Park. 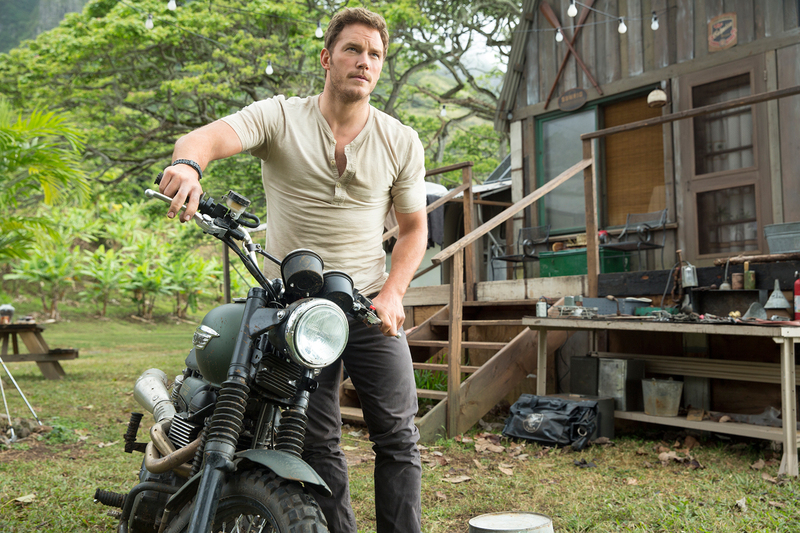 I love the charismatic Chris Pratt and I am a sucker for dinosaurs, so I was definitely interested in its June release date! 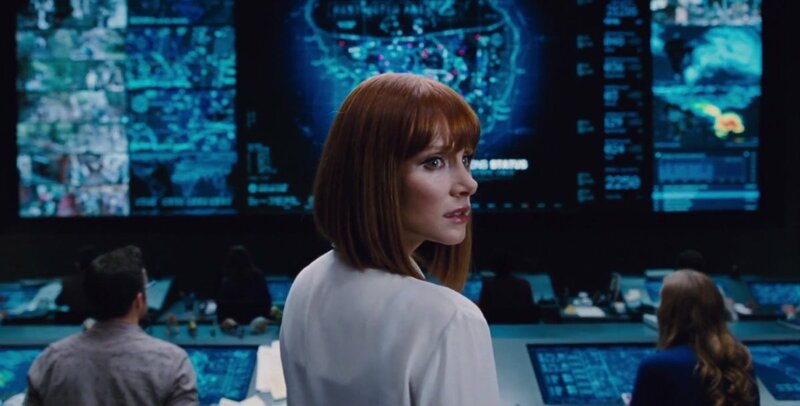 I was clearly not the only one, Jurassic World broke several records during its opening weekend by surpassing both The Avengers and Harry Potter and the Deathly Hallows – Part 2. 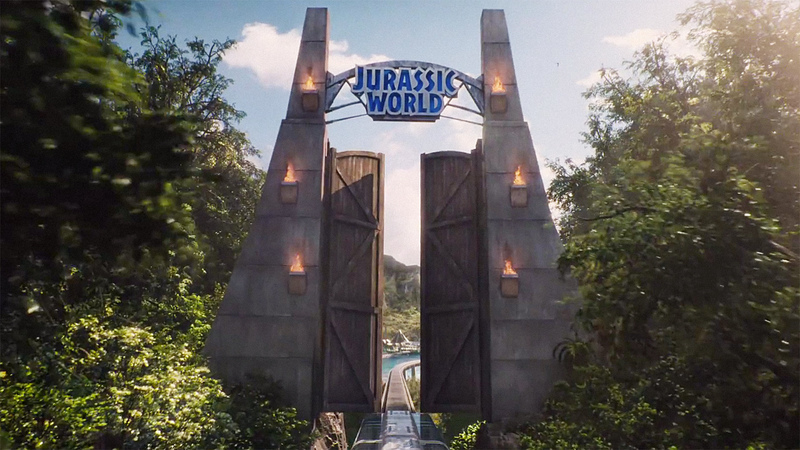 “Jurassic World” on Isla Nublar has evolved into a massive fully functional dinosaur theme park with a vast amount of rides and species. 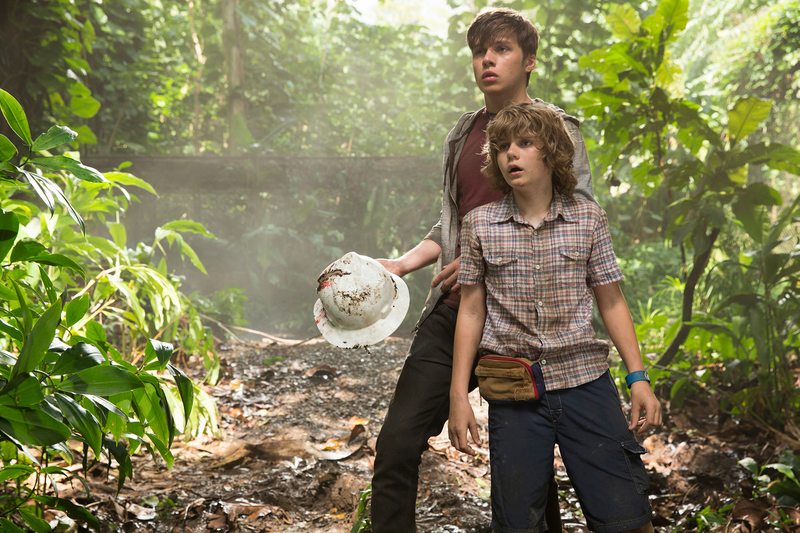 Jurassic World begins with two brothers Zach (Nick Robinson) and Gray Mitchell (Ty Simpkins) heading off to visit their aunt and the park’s Operations Manager Claire Dearing (Bryce Dallas Howard). After months of low attendance, Claire has been working to attract investors with the release of bigger and better dinosaur attractions. InGen, the company that owns the park, has encouraged its geneticists to continue to the raise the bar with experimental species modification. As a result, they created a brand-new genetically-modified dinosaur called the Indominus rex which has been created with the DNA of a mystery combination of predators. 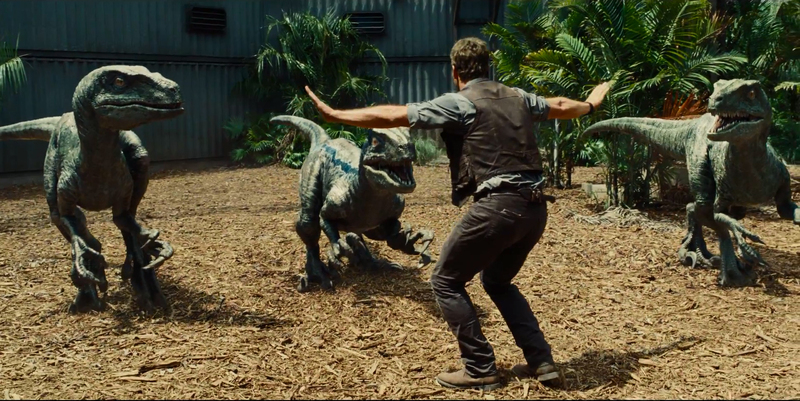 This lethal combination has the park’s owner Simon Masrani (Irrfan Khan) a little uneasy, so he recruits the help of velociraptor trainer Owen Grady (Chris Pratt) to inspect the exhibit before its is opened to the public. 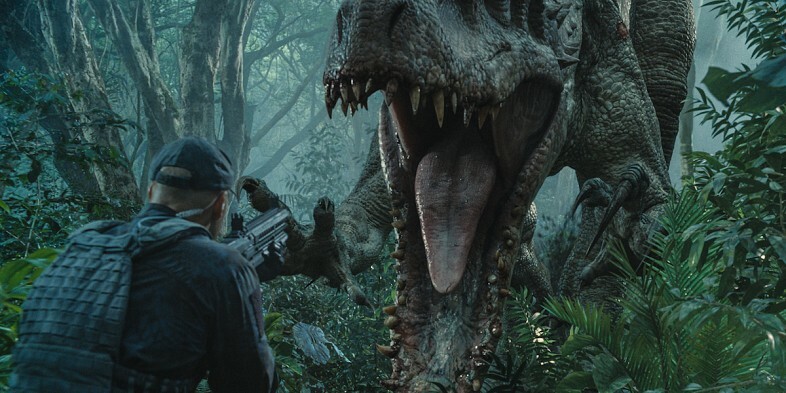 A sub-plot to the potential release of the Indominus attraction involves the head of InGen security Vic Hoskins (Vincent D’Onofrio), and his plan to train the four velociraptors for military use. Owen shows impressive control of the raptors in both his training and his impromptu rescue mission of a staff member when a routine feeding goes array. Vic believes this is proof that they are ready, however, Owen argues they will never be ready because even though he is their alpha it does not mean that they are controllable. Claire is hesitant when Owen comes to inspect the Indominus exhibit, but he is clear in stating that this hybrid is extremely dangerous because she has been in isolation since birth. The film then takes a dramatic turn when Owen notices claw marks on the wall. Owen believes Indominus has scaled the wall to escape, but when he and the staff enter the exhibit to take a closer look they quickly realize they’ve made a huge mistake when she comes out of hiding to attack. Owen’s wit and experience saves his life, but Indominus still ends up killing the other staff members before running off into the wilderness for the first time. Meanwhile, Zach and Gray are upset that their aunt is working instead of spending the day exploring the park with them. Therefore, they sneak off from Claire’s assistant and try out the gyrosphere ride (Sidenote: the sphere features a hilariously random Jimmy Fallon safety video). Claire orders an evacuation and for all ride member to return to base, but the boys press on in rebellious curiosity. I loved that the brothers stumble upon the building and vehicles used for the original “Jurassic Park” attraction. It was perfect for all of the nostalgic fans! The CGI for the dinosaurs was AMAZING! I thought the Indominus rex in direct comparison to the Tyrannosaurus rex looked spectacular. I also loved the velociraptors, pterodactyls, and stegosauruses. Chris Pratt was excellent in the role of Owen Grady the military man turned impressive trainer turned impromptu dinosaur tracker/hunter. He is intelligent, has strong survival skills, and is brilliant on a motorcycle. 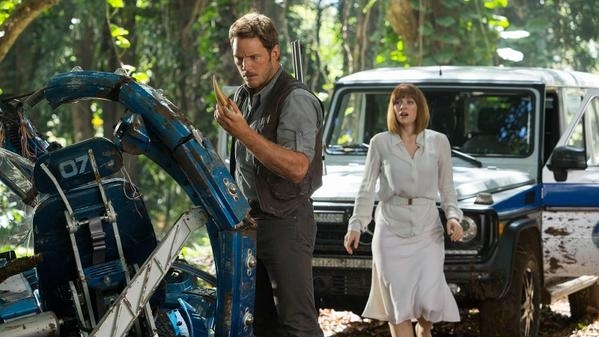 Bonus: if you are looking for a little extra, check out the videos below for both the official trailer and an interview of a few of the actors including Chris Pratt, Bryce Dallas Howard, as well as Director Colin Trevorrow, and whether or not they would want Jurassic World to exist in real life.